Fixed or Adjustable Riser options. Castor & Track Skate Wheels available. 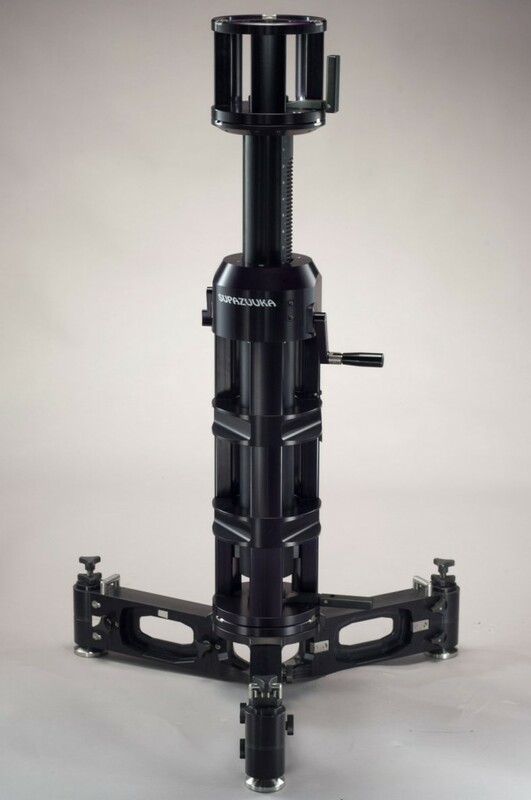 The EuroBoss, with it‘s 100 mm diameter mating face is just not strong enough, put together a boss-type bazooka column of more than 600 mm, add a large fluid head or gears and see how much flex you've put up with. Our patented connection starts with a ‘true’ Mitchell top fitting, adds a quickly removable tri-point adapter, and with it‘s opposite becomes a fast, familiar, very secure fitting. Any of the leveling jacks can easily be replaced by scaffold tubes – securely held by the built-in clamps. Uses no tools to change its configuration. No tools required to either fit or adjust. Optimized gearbox ratio allows easy height adjust under full load – without affecting the level. Available in two height ranges, 300 to 410 mm and 600 to 1000 mm. Our new 4-way combi leveler, designed with multiple base options including Bazooka, Mitchell and Euro fittings designed to level the camera as quick and intuitive as possible.